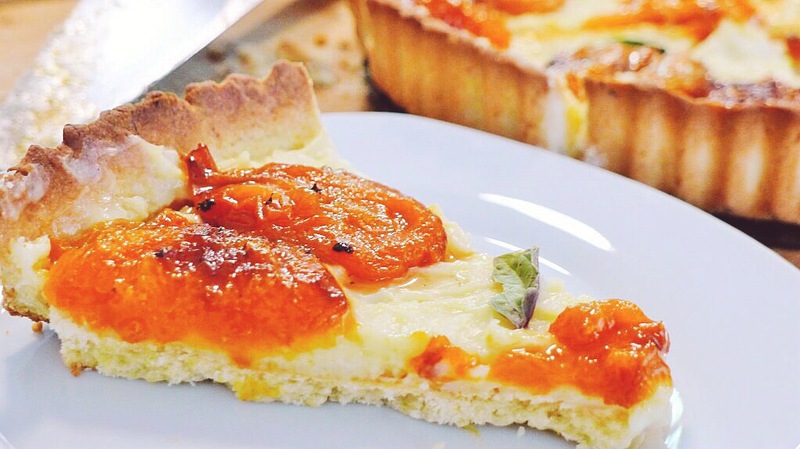 Pastry chef Roy Shvartzapel layers roasted fresh apricots atop basil custard to make a gorgeous tart. The tender crust is extraordinary: Combining hard-boiled egg yolk and potato starch, it’s based on a classic dough that he learned from Paris pastry genius Pierre Hermé. 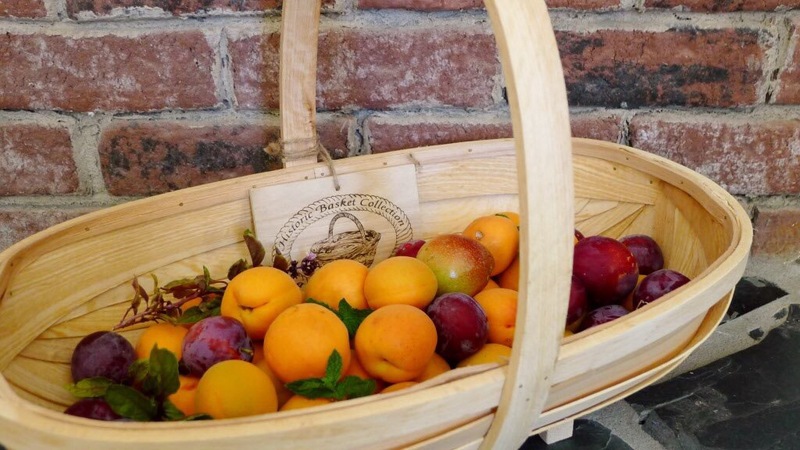 Fruits and herbs freshly picked from our orchard and herb garden. ***NOTE: I used glutinous rice flour as a substitute for potato starch. 1. In a small saucepan, combine 3/4 cup of the milk with the sugar and basil; bring to a simmer. Remove the milk from the heat and let stand for 15 minutes. Remove the basil and squeeze any milk back into the pan; discard the basil. 2. In a small bowl, whisk the remaining 1/4 cup of milk with the yolks and cornstarch until smooth. Slowly whisk the egg yolk mixture into the warm milk; bring to a simmer over moderate heat, whisking constantly until very thick, 2 minutes. Remove from the heat and whisk in the butter until melted. Scrape the cream into a bowl. Press a piece of plastic wrap directly on the surface and refrigerate until chilled, 2 hours. 3. Preheat the oven to 450°. Line a baking sheet with parchment paper. Arrange the apricot halves cut side up on the paper and sprinkle all over with the sugar. Roast for about 20 minutes, until the apricots are tender and lightly browned. Let the apricots stand until completely cooled, about 30 minutes. 4. In the bowl of a standing mixer, beat the hard-boiled egg yolk with the butter and sugar at medium speed until smooth, about 2 minutes. Add the flour, potato starch and salt and beat at low-speed until just combined. Using lightly floured hands, press the dough evenly over the bottom and up the side of the tart pan. Refrigerate the crust for 30 minutes, or until chilled. 5. Decrease the oven temperature to 375°. Spray a 14-by-4 1/2-inch rectangular tart pan*** with a removable bottom with nonstick cooking spray. Bake the crust for about 25 minutes, until golden. ***NOTE: To make a 9-inch round tart, press the dough into a 9-inch round fluted tart pan with a removable bottom. Use 8-10 apricots and 1/4 cup of sugar for sprinkling. Double the pastry cream. Bake for 40 minutes. Transfer the crust to a rack and let stand until cooled, about 1 hour. 6. Unmold the crust and transfer it to a serving plate. Using a small offset spatula, spread the cream evenly in the crust. Arrange the apricots on the cream, cut sides down, and brush with the melted jam. Cut the tart crosswise into strips and serve at once. Original recipe excerpt from the Editors of Food & Wine Magazine. “Food & Wine: 20 Best Dessert Recipes.” American Express Publishing Corporation, 2012-11-27. iBooks. Posted in Desserts, Menu and tagged artisanal, baking, foodies, homemade, made from scratch, recipes. Bookmark the permalink.